Yvan cooked us the most beautiful meal and was a delightful gentleman. Thanks for a fantastic dinner! I just wanted to let you know that we have been very pleased with all 3 chefs - Yvan, Damien and Youcef. We would highly recommend all 3. Yvan was a highlight of our visit. This was our second time with Only Provence and we are very happy with the service. Our first evening was a pure delight, since Yvan came to give us a cooking course. My children are still raving about the dessert! My favourite was the starter - and the best is that we go to take the recipes home with us to be used over and over and over again. I would not give that a miss, if I were to go again. Chef Yvan 5 Star ! Thank you so much for organizing the Trevallon visit! We enjoyed it so much! Also, thank you for your lovely dinners! They were one of the highlights of our stay in Provence!!! We look forward to another wonderful dinner next time we are in Provence! Thank you very much on behalf of our entire group for the two superb meals you prepared for us last night and on Monday. As we were leaving this morning, we all agreed that they were the highlights of our culinary experience during the week! Thank you so much Yvan for an absolutely delicious meal! We all enjoyed it very much! We would like to book you for another evening next week . Our preference would be Wed. evening. Please let us know which evenings you are available next week. Let me again thank you for our last dinner.... everyone loved your meals & each course was great. Many many thanks for a wonderful dinner that you cooked for us on Sunday night - delicious food and amazing service. Thank you again. We would strongly recommend Mas Allure, Only Provence and our chef (and his wife who acted as a waiter for the night). I just want to thank you on behalf of the group of six last Friday for a wonderful meal. Your cooking and presentation was really appreciated by all of us. We had Chef Yvan come to our Villa to give us a cooking demonstration and meal. He was great fun and very skilled. His English is also very impressive. We would thoroughly recommend him and the time we had with him was one of the holiday highlights. Just a quick note to say how much we enjoyed dinner on Tuesday. Each course was outstanding, so it's impossible to say one was better than the other. Thank you for choosing, preparing and serving such a wonderful meal for us. We also want to thank you for arranging a tour of Trevallon for us. The winemaker showed us the vineyard and wine-making facilities, and he allowed us to taste wines from different grapes in the casks. It was incredibly enjoyable. Thank you so much!! We enjoyed meeting you and hope we have the occasion to meet again. Thanks for the best holiday we have had in a long time. Truly exceptional meal… highly recommend for a "last special supper.” The vegetable bouillabaisse was one of the best food experience some of us had ever had in a lifetime. We had Yvan come for a cooking class. He was fantastic. I would highly recommend him. He gave an excellent class with the right amount of expertise, wit & Gallic charm. We had a thoroughly entertaining evening and learned a lot. The food was great, too! We had Yvan to teach and cook for us last Tuesday and I have to say that he was absolutely fabulous !!! It could not have been a better night !! We had Chef Ivan and his assistant Andre cater for a dinner party for 10 of us. The food was absolutely delicious and highlighted local produce and recipes. They were the friendliest and most professional team and I can not recommend them highly enough. Chef Yvan was good - food was excellent, he was fine but I got the sense he wanted to get in and out as soon as possible. Nothing major and we had a good night but that was my sense. We all want to thank you for the wonderful meal last night. The food was absolutely delicious and made the evening so memorable for Sue's special occasion. I did appreciate your professionalism and your tolerance for the timing with the kids. I hope we can return here and would certainly reserve a dinner with you again. Please thank Andre as he was a wonderful assistant. Thanks for recommending chef Yvan! The chef we had , he was superb.A very simple menu , but cooked to perfection. Just wanted to thank you for organizing last night amazing meal! We all enjoyed Yvan's delicious meal - each course was full of flavor and wonderfully presented! I would strongly recommend Only Provence, and the chefs on offer. Chef Yvan was fantastic. He is a terrific host for a meal and the food he prepared was excellent. We had 6 adults for dinner and all of us thought it was superb. Chef at house and wine tour were great. Chef Yvan was exceptional. Chef Yvan is very highly recommended as he prepared a wonderful gourmet dinner of stuffed zucchini flowers, lamb Provencal, and freshly made sorbet. Made a few special modifications for the children. Unobtrusive, friendly, served and cleaned up leaving the kitchen spotless. I don't even know how to explain how perfect everything was. The home, the chef, the team at Only Provence provides a perfect setting for a wonderful vacation. Chef Yvan is a gifted cook. He made some of the best meals we had during our stay and was a lovely person. 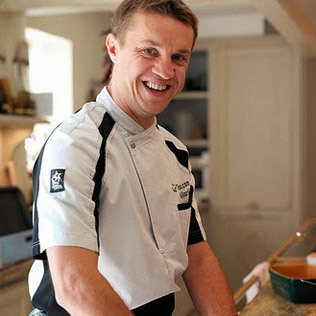 We definitely hope to have him cook for us on our next stay with Only Provence. Chef Yvan came on Wednesday for a cooking lesson. There were 4 of us—3 non-cooks and a wonderful cook. His open smile and infectious laugh and joy in the kitchen made is SUCH a special experience! He’s a wonderful man and, once again, we ate a brilliant dinner! Our experience exceeded all expectations. first of all, we were delayed at least 4 hours from the States and missed our initial train. When we arrived in Avignon our cars weren't ready but we took what they had and raced to Gigondas. By the time we arrived a couples hours later, jet lagged and ready to drop, the meal was nearly ready. And what a meal it was. Yves brought over some wine from Domaine Santa Duc and we paired it with our dinner. Both were fabulous! During the meal, our family peppered him with questions on food and food preparation which he answered with patience and brevity. We had so much fun, we'd highly recommend him. At the end of the trip, everyone said this meal was their absolute favorite of the whole trip. We had chef Yvan prepare a special dinner for all of us and it turned out to be the highlight of the trip! From the presentation to the taste it was superb. We had the choice of amazing chefs and tour guide to enhance a perfect stay! Chef Yvan came to teach a cooking class and prepare a meal. Yvan was a lot of fun. However our ability to really learn or replicate the meal was limited given that nothing was printed and measurements etc. are different in the U.S. It would have been great to get a copy of the recipes that could be converted into U.S. measurements. That said, we all had fun in the kitchen with Yvan and the meal was very good. Yvan brought all of his supplies and left the kitchen spotless. He was really pleasant and fun to talk to. Chef Yvan exceeded all expectations and is highly recommended. He cooked a four course meal for us on three different occasions and every dish was beyond delicious. ?? We would like to thank you for such a wonderful evening July 9th at Mas de Montolivet. Each course topped the one before, and the lovely raspberry cake and cheese ice cream ended the evening perfectly. We admired your efficiency and professional expertise in the kitchen. Merci beaucoup pour la fantastique anniversaire! We had a wonderful gourmet meal prepared by Chef Yvan – saffron foam over roasted legumes, pan roasted Cobia over a delicate ravioli d’aubergines – amazing! Chef Yvann provided scrumptious meals and wonderful instructions for adults as well as the kids. We want to thank you so much for an incredible dinner last night. What a perfect evening and your food was fantastic. We all so enjoyed meeting you. Thank you very much for the wonderful dinner. Everyone enjoyed each course! We highly recommend Yvan as a chef. His food as amazing. Thank you for a wonderful dinner! Everyone loved it! Thank you again for such a wonderful meal Thursday night...we absolutely loved every minute of it. Chef Yvan was fabulous! Thank you very much. He was very accommodating and worked with us on he nut allergy. Food was wonderful! A highlight of our stay in Provence was the meal prepared and served by Chef Yvan! The meal started with a wonderful vegetable bouillabaisse that was filled with flavorful oven roasted veggies topped with a rich whipped foam broth. That tasty starter was followed by a perfectly cooked pork loin with a wonderful reduction sauce all on top of a carrot mousseline. It looked, smelled and tasted incredible. A dessert of chocolate lava cake topped with the most intense raspberry sorbet and fresh raspberries was by far the best dessert we had in France! We highly recommend Chef Yvan for a tasty, enjoyable and memorable evening. On behalf of the whole family we would like to thank you very much for an absolutely delicious, beautiful, and memorable dinner. The experience watching you was fun. We enjoyed it so very much. Thank you so much for the delicious meal you prepared for us last night. The flavours were exquisite.